100% Authentic 925 Sterling Silver Charm pendant. Category: Charm pendant. Material:925 Sterling Silver. 100% Authentic 925 Sterling Silver Charm pendant. Category: Charm pendant. Material:925 Sterling Silver. Note - the image on the photo might be bigger than the actual size of the item in order to show details clearly. 100% Authentic 925 Sterling Silver Charm pendant. Category: Charm pendant. Material: 925 Sterling Silver. Note - the image on the photo might be bigger than the actual size of the item in order to show details clearly. 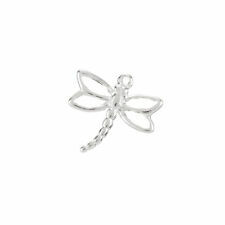 This beautiful charm will be a wonderful addition to your bracelet or necklace. Material: 100% Authentic 925 Sterling Silver. Note - the image on the photo might be bigger than the actual size of the item in order to show details clearly. ONE LOVELY STERLING SILVER HEDGEHOG CHARM / PENDANT WITH CLOSED RING. Charm is nickel free. Charm is polished sterling silver. SIZE OF CHARM: 10.5 WIDTH X 8 MM HEIGHT. The charm weighs about 1.1 grams. ONE STERLING SILVER SEA HORSE / SEAHORSE CHARM / PENDANT WITH INTEGRAL RING. 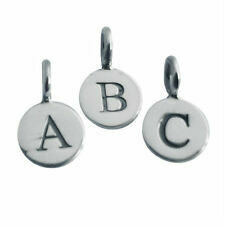 Use a 6 mm sterling silver lock ring to attach this charm securely to a necklace chain. Height of charm: 16 mm. Width of charm: 6 mm. Use a 6 mm sterling silver lock ring to attach charm securely to a necklace chain or bracelet. Charm weighs approx 0.51 grams including jump ring. Sterling silver oval open jump ring included, stamped 925, size 7 x 5 mm. 100% Authentic 925 Sterling Silver Charm pendant. Material: 100% Authentic 925 Sterling Silver. Note - the image on the photo might be bigger than the actual size of the item in order to show details clearly. STERLING SILVER OVAL OPEN JUMP RING INCLUDED, STAMPED 925: SIZE 7 MM. PENDANT IS STAMPED 925. THICKNESS OF CHARM: APPROX 1 MM. Charm and jump ring are genuine sterling silver. 925 Sterling Silver Charm. Material : Sterling Silver. Note - the image on the photo might be bigger than the actual size of the item in order to show details clearly. Material: Sterling Silver ( Stamped 925). Quantity: 1Note - the image on the photo might be bigger than the actual size of the item in order to show details clearly. 100% Authentic 925 Sterling Silver. Material: Sterling Silver. Note - the image on the photo might be bigger than the actual size of the item in order to show details clearly. 1 STERLING SILVER 925 TREE OF LIFE CHARM / PENDANT WITH OPEN JUMP RING. STERLING SILVER OVAL OPEN JUMP RING INCLUDED: SIZE 7 MM. PENDANT IS STAMPED 925 AT BASE OF TREE TRUNK ON ONE SIDE. THICKNESS OF CHARM: APPROX 1 MM. ONE STERLING SILVER 925 TEDDY BEAR CHARM / PENDANT WITH INTEGRAL CLOSED RING. Use a 6 mm sterling silver lock ring to attach charm securely to a necklace chain or bracelet. Charm is made of polished sterling silver and is nickel free. Perfect for creating harmony to jewellery designs, this antique sterling silver Tibetan charm is a beautiful delicate feather shape, ideal for bracelets, necklaces and earrings. The charm's loop hole can be opened and closed using jewellery pliers. 100% Authentic 925 Sterling Silver Charm pendant. Category: Charm pendant. Length: 3cm (including clasp). Material:925 Sterling Silver. Note - the image on the photo might be bigger than the actual size of the item in order to show details clearly. 100% Authentic 925 Sterling Silver. Material: Sterling Silver. 100% Authentic 925 Sterling Silver Charm pendant. Material: 925 Sterling Silver. Category: Charm pendant. Note - the image on the photo might be bigger than the actual size of the item in order to show details clearly. 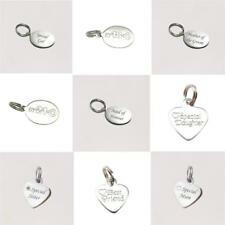 Sterling Silver 925 Jewellery Price Stickers Tags Labels Dumbells For Rings etc.